This breakfast or afternoon tea toast is like no other. From Japan, this home made version of the famous Shibuya Brick Toast will have you falling for its buttery, honey soaked crunch. The ice cream and Nutella make it that much more irresistible! Serves 2 or 1 very hungry person! The other day I was having a really busy time. Like almost having to skip lunch busy (and trust me, I never forget or forgo lunch). I had also completely forgotten that I was expecting a package. It was a new phone that I was being loaned for a few days for an event and around 5pm, I suddenly remembered that the courier hadn't come before noon as promised. I rang the sender who rang the courier straight away and rang me back. "They said that they left it on your balcony," she said. "My balcony?" I asked puzzled. "But I was home all day. And my balcony is not on the ground floor...and it's ermmm attached to our apartment," I explained, thoroughly confused wondering if someone had managed to unlock both doors and walk through our small apartment while I was right there. I mean I had been busy but I would definitely have noticed a knock and I would have most certainly noticed a human. "Hang on, just let me look on the balcony," I said to her. And sure enough, on our first floor balcony, caught up in the branches of my pot plants was the box that contained the phone! "Errr I think they threw it up here!" I told her wondering why on earth someone would have bypassed the traditional knock on the front door to fling something up to my balcony. We have a small apartment so you can hear a knock from anywhere there even behind closed doors. Plus who throws things up a floor? It was as if he took the most risky and difficult route possible! Speaking of unusual things, do you remember this man toast from a couple of weekends ago? Well I've got the sweet counterpart for you. 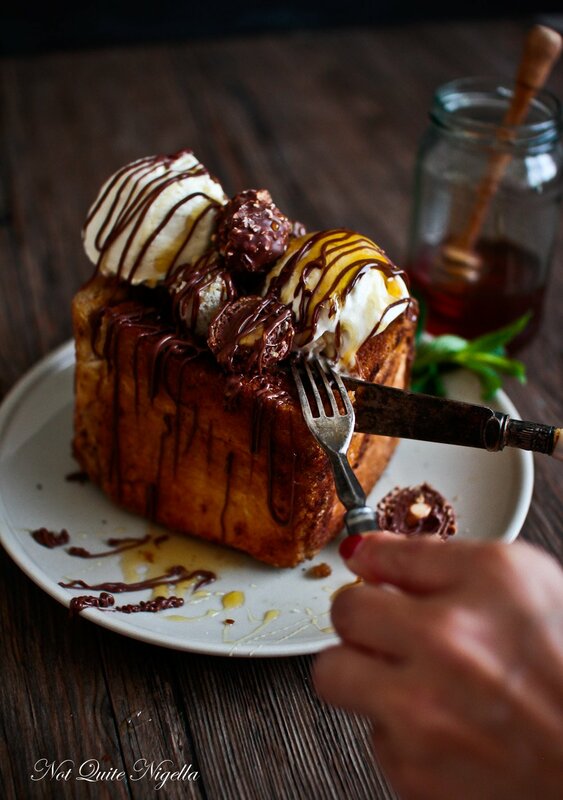 This Shibuya brick toast is the original item that inspired the Man Toast. In Asia there are loads of dessert cafes that sell something similar to this. 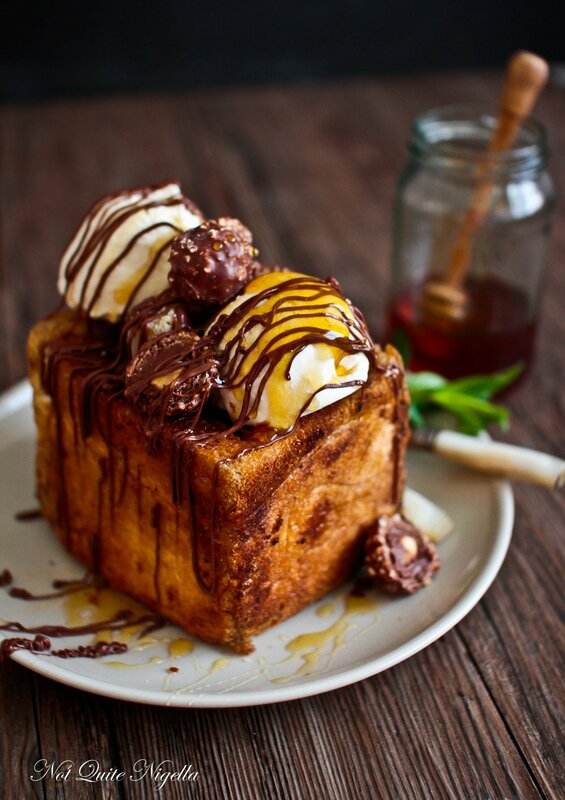 It starts with a thick wad of buttered honey toast and can be topped with ice cream, cream, chocolate sauce or different flavourings. Here I thought I'd make a classic chocolate and honey except I'd take the easiest route and just use Nutella instead of melting chocolate. Even Mr NQN who doesn't like bread or toast ate this happily (actually he ate two of them but not in the one sitting!). There is something magical that happens when you combine butter and honey together with toast. This is also very impressive but easy to put together. Definitely not the most risky and difficult route to a snack or meal! 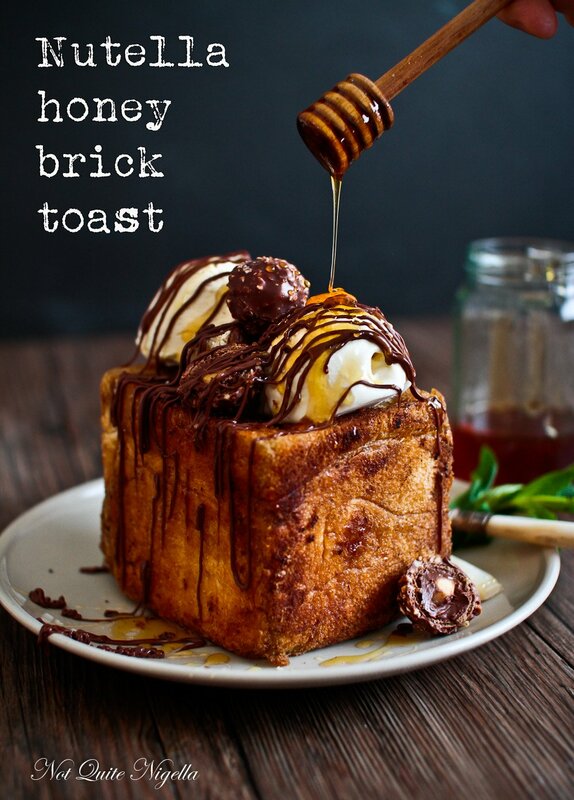 So tell me Dear Reader, have you ever eaten Shibuya brick toast? And would you prefer a savoury or sweet version? Have you ever had a strange delivery like this? Step 1 - Preheat grill or heat up a frypan (I don't trust my grill completely so I did it in the frypan where I could see everything). Cut the bread in half across ways. Place the Nutella into a small piping bag (or use a zip lock bag with the end snipped off). Generously butter all of the sides of the two pieces of bread and grill or fry until toasted on all sides. Step 2 - Place scoops of ice cream and cut Ferrero Rochers on top. Drizzle with honey and pipe the Nutella on top. recipeKorvapuusti: Finnish Cinnamon Cardamom Buns! recipeSalted Caramel and Nutella Fronuts! recipeThe Softest Bakery Style Hot Cross Buns for Easter! recipe Korvapuusti: Finnish Cinnamon Cardamom Buns! recipe Salted Caramel and Nutella Fronuts!